Slaw also known as cole slaw or coleslaw is a salad consisting primarily of finely shredded raw cabbage and dressed most commonly with a vinaigrette salad dressing (made by mixing an oil with something acidic like vinegar or lemon juice and enhanced with salt, some herbs). 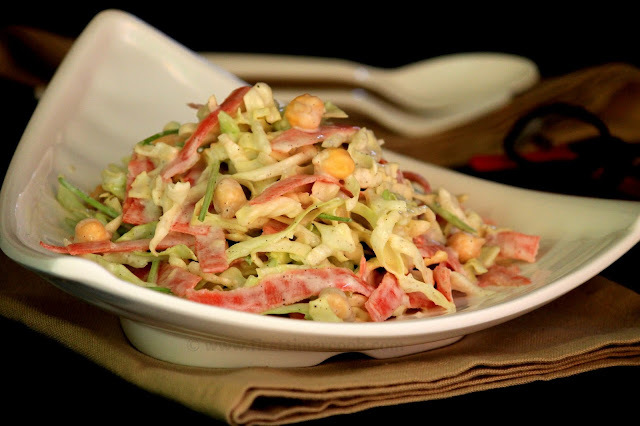 Slaw is a Dutch originated word which is shortened from salad. Here I have added chickpeas to the slaw with a yogurt based dressing. What a magical dish, you can say ! 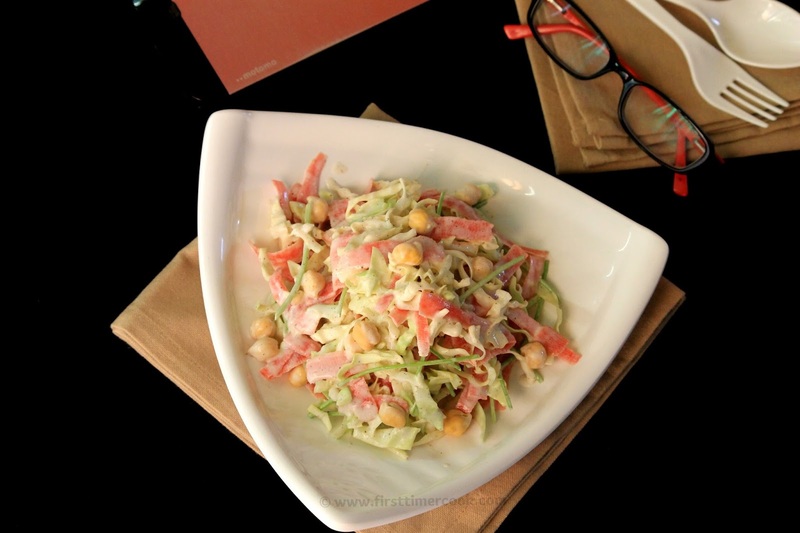 A chickpea slaw, more specifically a salad with chickpea, cabbage, carrot and a yogurt-vinegar based dressing. Chickpeas (garbanzo beans) are stacked with thinning safe starch where as yogurt is an excellent source of protein and the amino acid present in yogurt helps in burning fat. 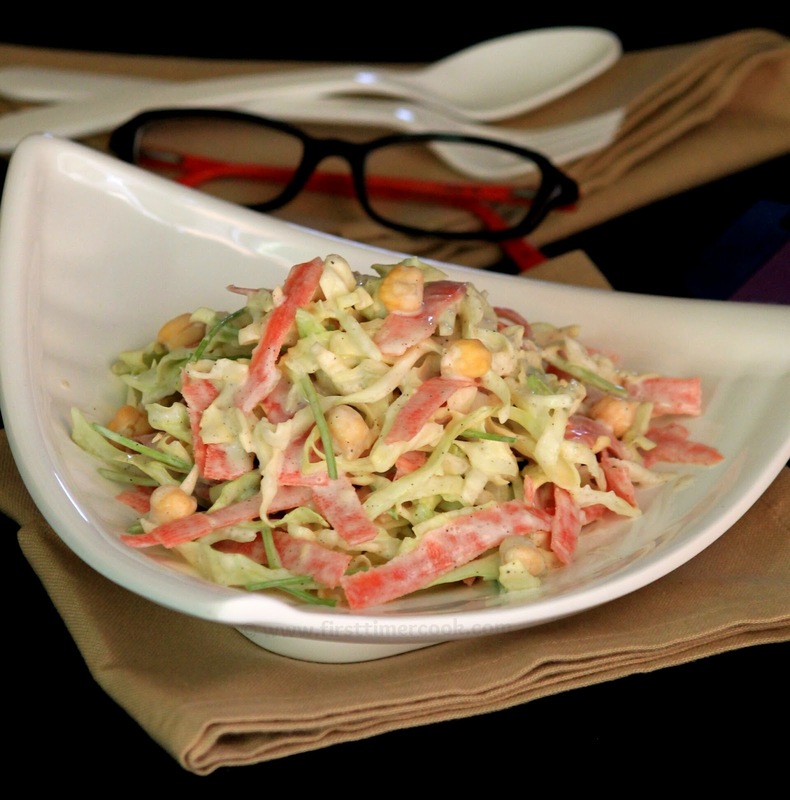 So this slaw is an awesome wellspring of protein and fiber, which will keep you full for a longer time. 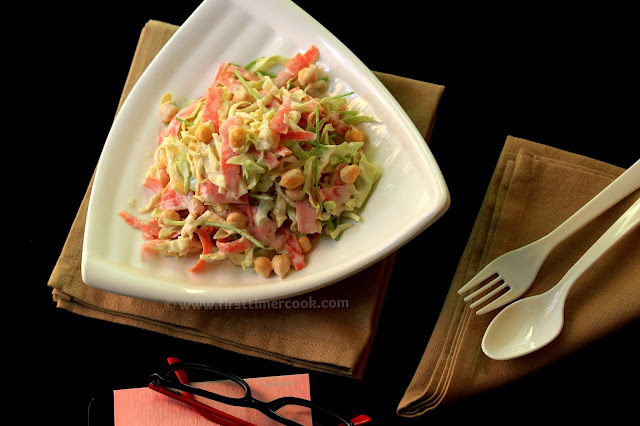 If you are planning for weight loss, then this chickpea slaw must be there in your diet plan. There are many variations of this slaw, which include the addition of red cabbage, pepper, onion, grated cheese, pineapple, mixed with a salad dressing such as mayonnaise. A variety of seasonings can also be added. The cabbage may come in finely minced pieces or shredded strips. This slaw is amazing one as it can be prepared in less than five minutes, the ingredients are super cheap and it doesn't get soggy. So just go for this chickpea slaw which is ridiculously filling. First peel the carrots with a vegetable peeler into strips. Then cut the celery stalk into thin slices, keep aside. In a medium bowl, now make the dressing. Put yogurt, vinegar, black pepper powder, salt and water. Stir well. Then add chickpeas, shredded cabbages, thinly sliced celery stalk and shredded carrots. Toss everything to combine well. Sprinkle the roasted sesame seeds on top, refrigerate for 3-4 hours and then serve ! Refrigeration part can be avoid. Serve as it is after sprinkling sesame seeds. I'm not a big fan of normal coleslaw but adding chickpeas and celery is a good idea. I can have a whole plateful of this.